Being a costume-freak with small income, "Best costume wins a prize in cash" naturally makes me jump at the chance. The department store I work for has a big semi-annual campaign called "Crazy Days", an apt name by the way. Fancy dress costumes are encouraged, perhaps to help the customers to get into the mood and indulge other pleaseant delusions like unlimited credit and so forth. I've had a witch-costume once (basically this one , at the bottom picture, with a yellow t-shirt over the black shirt and the hat trimmed with yellow wool net, a bat and a frog) and a funny polonaise-type of yellow creation over a black skirt another time. After a few years break they were actually giving out prizes again this time - I wonder who forgot the recession. 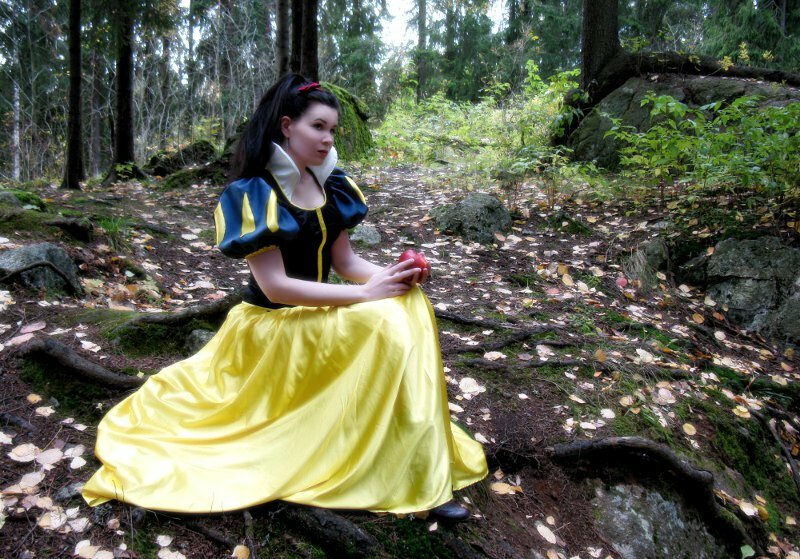 Anyway, as the theme colors are black and yellow (truly maddening), I thought Snow White might go down well with the big yellow skirt. And besides, it's such a pretty costume, I've never quite grown up when it comes to pretty frocks as everyone knows, I wanted to try out the standing collar, and Rammstein has a lovely, classic twisted music video with evil Snow White, too... And my hair needed a fresh dye anyway. I made some changes on the classic Disney costume with the colour theme in mind, replacing the red lining on the slashed sleeves with yellow and making the bodice black instead of dark blue. I left the sleeves blue, however, as I felt Snow White had to wear some blue. The hairband is the classic red one too. With a limited time I was happy to find a perfect inexpensive light yellow satin, and apart from that, the black velvet on the bodice and a zipper I found the rest of the materials from my storeroom. The challenge in the design was not so much to make it look like a Disney picture, but to be able to wear it for four days working, carrying heavy coats and stuff, folding intermidable piles of clothes etc, and have it look great and be comfortable all the time. Of course, Disney gives us to understand that Snow White used to take care of the household of seven (albeit small) men dressed like this. I cut the skirt half-circle with one seam (fast and pretty), the length is a practical about 5cm off the ground, and the waist has a comfortable elastic band. I wore a ruffled cotton skirt under it to give the skirt some fullness. I made the bodice out of a very elastic velvet, which was a bit annoyingly stretchy to work with but very nice to wear. It's edged with the satin of the skirt, not just because it was done so in the original but also because it's a quite handy way of fiinishing stretchy materials and freehand-cut necklines, rather than try to figure out a pattern for the facing. The Disney artist has also been very considerate towards all costumers in drawing the yellow stripe on the center front of the bodice - perfect for hiding a zipper. I'm not very good with zippers, and the inserting of this one here does not bear closer inspection either. I fussed quite a bit to get the bodice fiit perfect, which may seem unnecessary but proved very wise, as I didn't have to pull it down once when wearing, nor take care not to flash anything while bowing etc, I could just complitely forget it. For the sleeve pattern I took a look at my pattern books, and chose a rather simple one. A sleeve more narrow at the sleeve head and fuller at the sleeve end would have been more accurate compared to the original costume, mine turned out to be bordering on the oversized, but at least it looks funny. Also the size and shape of the slashing is not perfect, but then again it shows more yellow. Yes, I didn't bother to make a mock up, feeling that it would be unnecessary to put too much trouble into a project like this, when I would be the only one to see the difference. The sleeves have four layers, the blue slashed one (the edges are slightly melted with a flame not to fray -the often bashed polyester has it's good qualities, too! ), the yellow satin, a layer of tulle to keep it puffy and finally a lining to prevent the tulle from irritating my skin. I managed to resist the temptation to gather the sleeve end into a neat yellow band, thinking of carrying the heavy coats again here, and finished it with a elastic band on a yellow casing, which proved to be very comfortable and look relatively ok.
Then it was time for the most interesting part, the collar. I had no intention to throw in just a white rufflelike you often see in cheap costumes, but wanted to at least try the lovely standing collar reminiscient of fairy tales. After taking a look at my school materials about collars I came up with a pattern I first tried on a dummy in the paper form. I had plenty of thin, slightly transparent taffeta and tulle, so I cut the collar without a further mock up. I first made it up of two layers of taffeta with the tulle between them, but it was pretty obvious that it was not going to stand up without additional support. 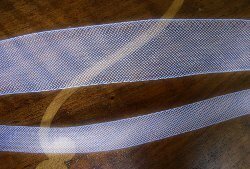 Some years ago when I was working at a bridal shop I had salvaged some net-like, elatic plastic braid (which I'm sure has a name but I don't know it, see the picture at the bottom of the page) used in the hemlines to support them, and as hems are in 98 cases out of 100 too long the braid usually ends up in the trash bin. The light, elastic braid turned out to be perfect for the collar. I stitched a 1cm wide one along the edge between the layers of taffeta and three strips of a 2cmwide one at the back of the collar to keep it up. The corners of the collar turn prettily outwards partly because my sewing machine hated the thin taffeta and gathered the stitches. I pinned the collar on the neckline and tried it on, testing to find the right curve as I still had some seam allowance to play with. I realised it worked best gathered a little at one point. Darts might have been a neater solution, but gathering worked well enough. I finished the lower edge with bias tape and stitched the collar on the neckline just next to the satin binding on the edge. And it worked, looked great and stayed up all the time without adjusting. A few times the corners in the front turned inwards but otherways it was perfect. The costume was finished with red lipstick and the red hairband. I made a short tape of red satin, cut in bias for settling into it's place better, and attached pins at the ends. 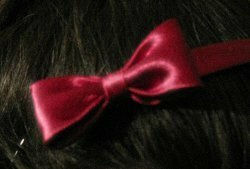 I changed the bow from the top of the head to one side, though, because it looked better to me. I had no idea to get a haircut to get the right Snow White hair, so I just combed mine in a ponytail to show the collar. The pictures are taken almost at my backyard, and caused some confusion on the minds of some people passing by, and the neighbor on the elevator. By the way, doesn't my skin look really magically smooth and luminiscent like fiits the character? I played a bit with photo manipulation, and not even much, I swear. Never despair over anything you see on a magazine cover, it's pretty easy to create, even for an amateur... I promise not to smooth the wrinkles away for my clothes, though!